The original Frank Zappa bust in Vilnius, Lithuania. Baltimore is honoring one of its artistic native sons, Frank Zappa. City officials were on hand Sunday to dedicate a bust of the eccentric musician. The bronze bust has been installed outside a library in east Baltimore. Zappa was known for everything from novelty rock songs to elaborate classical compositions. He died in 1993. 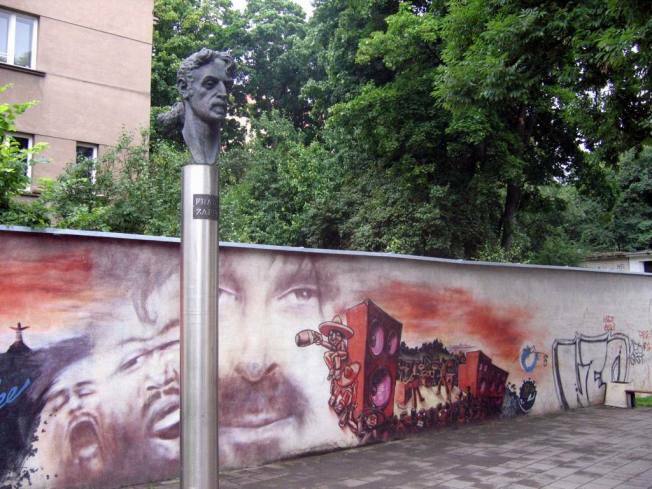 The bust is a replica of one that stands in a public square in Vilnius, Lithuania, and was donated to the city by Zappa fans in that country. Zappa was born in Baltimore, but his music was more popular in Europe than in the United States. His widow, Gail Zappa, said libraries were essential to her husband's musical education, and that's why she's happy with the placement of the bust.